Hair loss in Chihuahuas can result from issues common to all canines or certain predispositions of this little breed. If your little Chi starts losing his hair, take him to the vet for an examination and diagnosis. Treatment depends on the cause of the alopecia, the formal name for hair loss. Genetic hair loss is common in Chihuahuas. 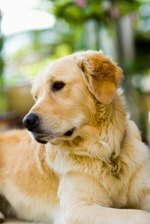 Initial symptoms of canine allergies, no matter the trigger, often appear as incessant scratching resulting in hair loss and bacterial infection. If your little guy is itching like crazy, your vet can identify an airborne inhalant -- such as mold, dust or pollen -- through allergy testing. Treatment might include a series of immunotherapy injections to help your Chi's body adapt to the allergen. If food causes the itching and hair loss, expect a long-term elimination diet to determine what type of protein or carbohydrate affects your dog. Once your dog's skin and itching stop while on a particular food, he'll likely eat that for the rest of his life. Various skin parasites can cause hair loss. If your Chi has a flea allergy, he's allergic to the flea's saliva. Your vet can recommend a topical or oral flea preventive to address the problem. Other parasites whose bites cause hair loss include mange mites, whose presence results in patchy or general alopecia. A topical flea preventive available from your vet can eradicate mange mites. Ringworm, which is a fungus and contagious to people and other pets, can cause redness, scaliness and hair loss. The hair falls out in a circular pattern, hence the term. Your vet will prescribe special shampoos for your dog to get rid of ringworm, along with anti-fungal oral medications. You must thoroughly disinfect your dog's living environment. Some Chis are genetically predisposed to bald spots. These areas of hair loss generally appear after the dog's first birthday, affecting the back, chest, thighs, neck and outer parts of the ear. While there's no treatment for this primarily cosmetic issue, take your Chi to the vet to ensure it is indeed hereditary hair loss and not an allergy or parasite infestation. If your fawn or blue Chi starts losing hair, he could be suffering from color dilution alopecia. While born with a normal coat, the affected dog's hair starts falling out between the ages of 6 months and 3 years. Hair loss usually occurs on the top of the animal's head and the back of the neck. Chronic bacterial skin infections often accompany color dilution alopecia. There's no cure for this hereditary condition, but your vet can prescribe antibiotics for skin infections and recommend moisturizers for dry skin. Chishuahuas with color dilution alopecia should not be bred.